Highly impressive new full-length from Ipek Gorgun. 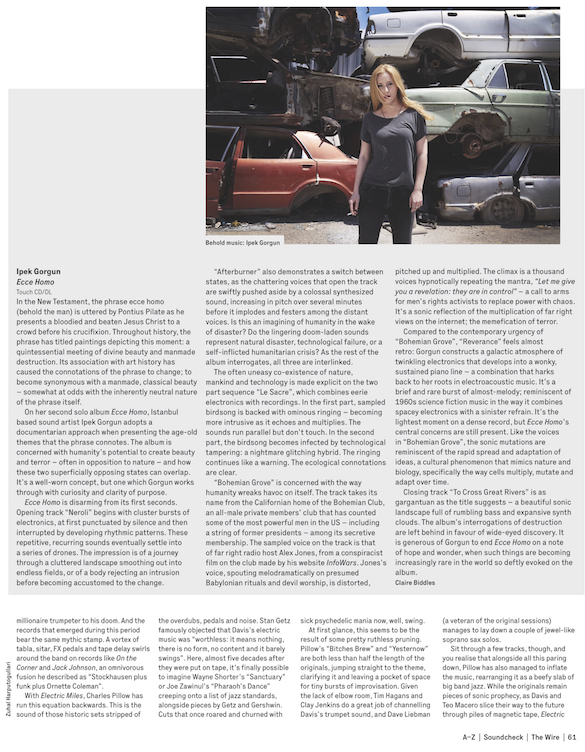 Eschewing any notions of easy-to-consume ambient music, Ipek instead orcestrates an ambitious mass of sound indebeted to musique concrète but also taking in field recordings and a documentary style that lends the album its winding narrative structure. If you’re into anything from Lenka Clayton’s collage work to Ilhan Mimaroglu’s pioneering electronic works – we wager this one will rule your world. “Ecce Homo explores the lighter and darker shades of the human psyche, behaviour and existence, and humanity’s ability to create beauty and destruction. What lies in the essence of such complexity has become a core idea for the album, while Gorgun seeks to figure out if there is a true meaning to being human, and human being. In the work of Ipek Gorgun, small moves and grand gestures are equally important. Before she molds her instrumental electronic music into massive shapes, the Turkish sound artist infuses it with precise detail. “I work with milliseconds in the beginning, then I switch to seconds, then to minutes,” she once explained. 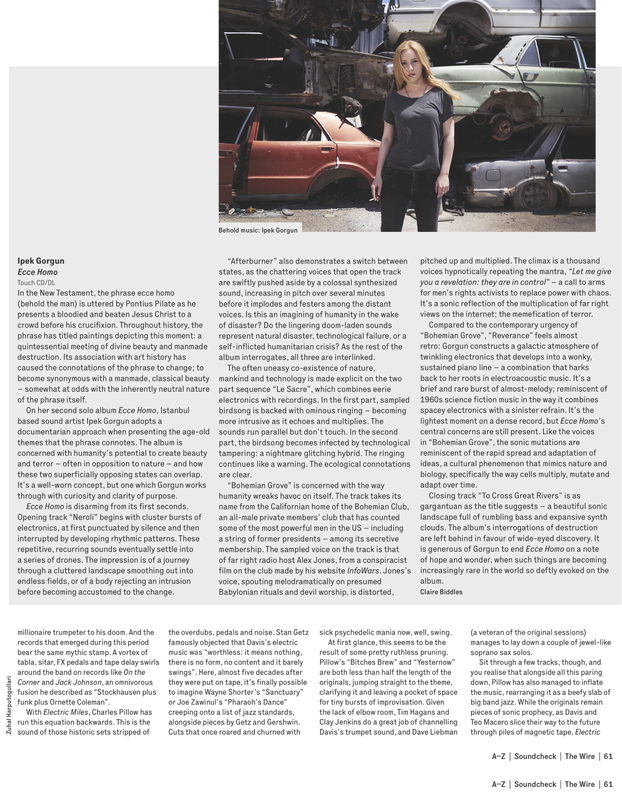 “At the end, I think about the whole arrangement of the structure… So I zoom in, zoom out, and try to find a way to fit everything in place.” As a result, her compositions connect on the micro level of individual sounds as well as on the macro level of widescreen narrative. FACT Rated is our series digging into the sounds and stories of the most vital breaking artists around right now. This week Adam Badí Donoval speaks to Turkish sound artist Ipek Gorgun about her new album Ecce Homo. Gorgun took up solo production after playing bass and singing in bands like Bedroomdrunk and Vector Hugo for over a decade. In 2016, she self-released her debut, Aphelion. Her latest follows a collaborative LP Perfect Lung with Ceramic TL fka Egyptrixx, performances at Sonar Istanbul and BBC Radio 3’s Open Ear and opening for the Royal Philharmonic Orchestra in Oggimusica Acousmonium with an electronic rework of Igor Stravinsky’s ‘The Firebird’. This outward quality of Ipek Gorgun’s music is new, and especially stark when compared to her “more introverted” debut which she says she wrote only in the solitude of night. Ecce Homo isn’t a nocturnal noise album, but rather a deeply insightful observation, and a reflection of our collective reality. Full of contrasts – bright and dark, heavy and light, glistening and dim, gentle and harsh – the album sounds holistic, open to many interpretations, and aware of its context and purpose. The glistening chimes of ‘Neroli’ tackles our fascination with nature; closer, the ominous ‘To Cross Great Rivers’, she says is an ode to mankind’s “never ending hopeless dream to conquer and control the world.” In between, she explores everything from capitalism to royalty and religious practice. These contrasts are certainly also connected to Gorgun’s instruments and sound sources. “In our lifetime we are exposed to millions of sound events, so why restrict ourselves by choosing a few components and stick to it in every single album?” she says. 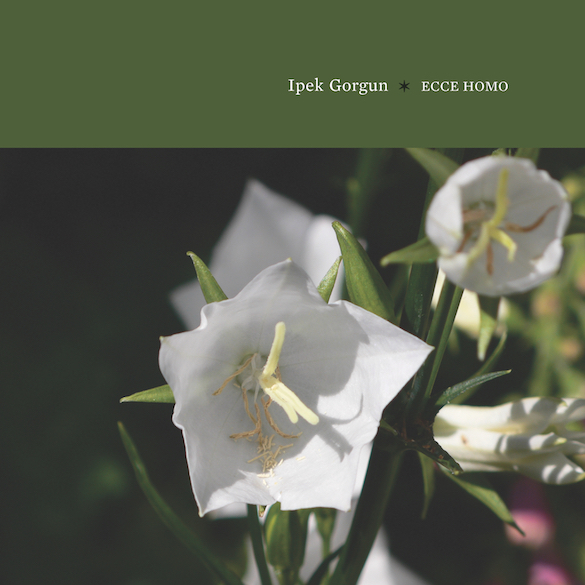 On Ecce Homo, Gorgun worked with guitars, piano, field recordings, samples, pedals, Ableton Live and MAX environments. The results play with our expectations of what is loud and harsh as opposed to gentle when it comes to sound. “We can still hear a mockingbird sing when the neighbors go crazy with the hammer and the drill,” she says. Ipek Gorgun has featured here before, so there’s little need to go deep into her history. In brief, she has played in rock bands, taken part in the Red Bull Music Academy, made music with Ceramic TL and completed a PhD in Sonic Arts. Very brief. She recently released her second album, Ecce Homo, and it’s a crystallisation of her efforts to date. Opener “Neroli” – named either for the essential oil of the bitter orange tree or a 1993 Brian Eno album (or both, or neither) – flourishes like a bright organ song on a spring morning, somehow both joyful and insidious in how it offers its welcome. Looped glistening harp notes feed terror and uncertainty, forward and reverse, like the time-lapsed opening and closing of the flowers that appear on the album’s cover. Tracks feature strange vocals in unknown languages, unknown to this writer at least. “Afterburner” moves from pitched-up male sounds into the building drone of the titular flight. “Tserin Dropchut” (more unknown words/languages?) features beautiful sounds that are undermined by distorted clipping, as well as throbbing bass that kicks down into your chest. Like being at a show where the levels are off in every direction, but in a good way. “Bohemian Grove” features the voice of right wing-fantasist Alex Jones, speaking about the supposed occultist tendencies of the eponymous campground. His words are repeated and looped over dark and muted bass tones. The word “Satan” is played over and over, Jones’s voice stretched and squeezed in tape-like format. It’s darkly comical, his paranoia rendered parodic. His almost prurient interest in this “twisted behaviour” becomes twisted itself, any demon worship rendered seductive and intriguing opposed to his conservative finger-wagging. This is an art piece, and his voice sounds many decades old, when in fact the recording is from 2000. It’s a heightened take on puritanism, reminiscent of Mylo’s “Destroy Rock & Roll”, only less danceable. “Seneca” features muted melodies that could be built from old-timey jazz records, while “Reverance” pits beautiful electronic bells against unsettling piano themes. “Mileva” – potentially named for Mileva Marić, a Serbian mathematician who studied under Einstein and later married him – continues the thread of dark tones, strange distortion, deep bass and overall dread. Gorgun’s work is fascinating in that it can leave a startling impression without lodging specific memories in your head. It’s a feeling. Bar the opening notes of “Neroli” and Jones’s deranged ranting in “Bohemian Grove”, it’s hard to think of single elements once the music stops playing. Whether that means the work is successful – in that it forces you to return and pay attention – or not – because it’s not memorable – is a question of perspective. Ours is that it works. On her second album, Ecce Homo, Gorgun explores sonic and theoretical motifs she’s only touched upon before, to striking effect. 2016’s Aphelion was comprised mostly of ominous tones. Last year’s collaboration with Ceramic TL, Perfect Lung, was a maximalist full-length that riffed on environmental degradation. Ecce Homo falls somewhere between the two LPs. Its electroacoustic compositions drill deep into your brain, always with a creeping sense of physical and existential pressure. Ecce Homo is tense and dynamic, changing from the micro (clicks, brief samples, single notes) to the macro (organs, concentrated filters, tenuous changes in melody) at a moment’s notice. But the macro moments are where Gorgun really thrives. The grating strings and chaotic vocal ambience of “Afterburner” are terrifying in their intensity. The subtler “Tserin Dopchut” feels like a windstorm, moving suddenly from piercing frequencies to heavy static chaos. “Bohemian Grove” samples an Alex Jones film from 2000, in which the right-wing conspiracy theorist tries to sneak into an elite Northern California gentlemen’s club to prove the existence of occult happenings. The track gradually becomes more glitchy and unhinged, to the point where Jones transforms into the satanic demon he’s warning us about. It’s a uniquely anthropological pursuit, but as with Gorgun’s debut and last year’s collaborative release with Toronto’s Ceramic TL, the subject of this record is an ontological one, with Gorgun endeavouring to “figure out if there is a true meaning to being human, and human being.” Answering those questions with an expressionistic palette that oscillates gently between noise and ambient music, Gorgun plugs into the landscape while harking back to philosophy, science, mathematics, and current events to place these consuming compositions in a variety of emotional contexts. After taking a sound bath in the lapping, glowing tones of album opener “Neroli” — think Eno’s iconic Windows startup sound struggling to assert itself through the fragmented lens of the pastiche digital present — “Afterburner” thrusts the action into overdrive, a subtle grinding noise growing to overcome a series of voices to manifest in an awesome, supersonic crescendo, the sheer spectacle of its force implying the jet fuel injectors for which the track is named. That display of man’s brazen dominion over nature is sharply contrasted with the anxious searching of “Tserin Dopchut,” where what sounds like it could be a field recording of a nature scene turns dark as chirps and croaks are abruptly manipulated into something menacing and violent, blurry squalls of snowy noise flooding your ears. It’s a reminder of the essentially tenuous position we occupy in the world, but with the track’s reference to a Siberian toddler that grabbed local headlines when they wandered coatless into the frigid, wolf-filled taiga, subsisting for three days only on a small supply of chocolate and the protection of a dog and two puppies before — amongst search parties of hundreds — his uncle found him and brought him home, there’s a nod to the persistence of the human will. The juxtaposition of these tracks with a collection of pieces addressing the corroded coexistence of humanity in the album’s latter half provides a compelling look at how we define ourselves in relation to others through class, ritual and technology, reducing the inflammatory conspiracy mongering of Alex Jones into a brain-melting collage on “Bohemian Grove,” while “Knightscope K5” — named for a Silicon Valley security droid — paints an increasingly hostile portrait of regulation, surveillance and data collection with oppressive blasts of noise.